DRY-UP™ Geo Channel is the most versatile drainage system on the market today! A dependable, non-clogging solution for wet basements. The DRY-UP™ Geo Channel’s unique ability to be placed on top of or next to the footing is a distinct advantage because of its ability to adapt to various foundations wall and gravel, so it’s less invasive, less messy, quicker to install and more cost effective than competitive systems. The DRY-UP™ Geo Channel catches water from the floor / wall joint and from under the center of the floor. The DRY-UP™ Geo Channel is made of high strength, high flow plastic drainage core wrapped in a non-woven geo-synthetic filter fabric. The DRY-UP™ Geo Channel fabric holds back all of the soil while allowing over 100 gpm of water to flow into the drainage core. When there is a heavy rain/snow melt, the soil around and under the basement foundation can saturate with water. When the ground under the basement floor becomes waterlogged, water normally comes up through cracks in the basement floor. This water in the soil by the basement foundation has to be released from the soil before it can drain to the sump pump and be evacuated away from your home. The DRY-UP™ Geo Channel’s non-woven fabric effectively releases the water from the soil at a rate of over 100 gpm. It allows the water to enter the drainage core along the entire length and height of the DRY-UP™ Geo Channel. The fabric holds back the soil but allows the water to pass through the soil and through the fabric. The DRY-UP™ Geo Channel is specifically engineered not to clog. The exception is in rare iron oxide soils where everything plugs. 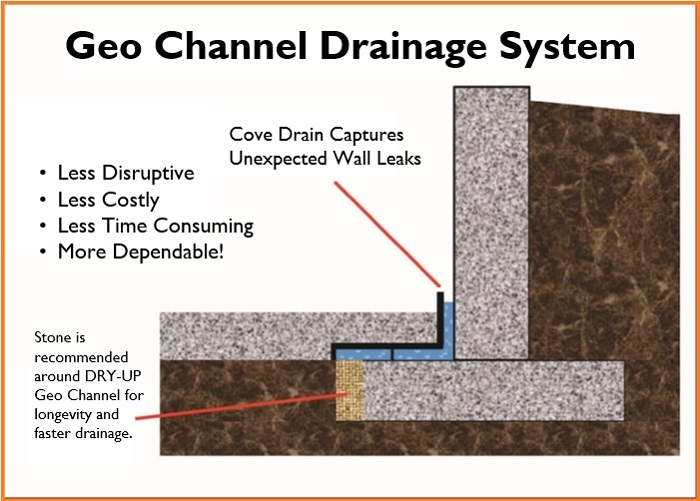 The DRY-UP™ Geo Channel releases the hydrostatic pressure underneath the basement so the water does not build up and come up through cracks causing a leaky basement. 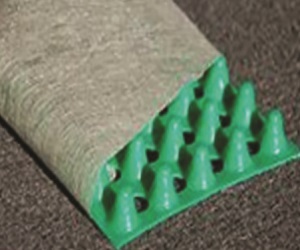 DRY-UP™ Geo Channel is a cost effective solution to relieve pressure underneath basement floors and keep basements dry. 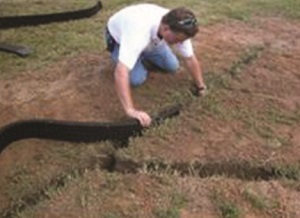 DRY-UP™ Geo Channel makes yard drainage easy. Large pipes and unsightly gravel beds are no longer necessary. The DRY-UP™ Geo Channel system is designed to sit in the mud and dirt with no gravel. The sod is cut and a small trench is created to install the DRY-UP™ Geo Channel. The dirt is back filled around the DRY-UP™ Geo Channel without using any stone and the yard is restored. DRY-UP™ Geo Channel yard drainage is the least disruptive, most effective way of solving yard drainage. Over the last 25 years the DRY-UP™ Geo Channel system has been used on many professional football fields to keep fields ready to play. Faster, Less Invasive, More Cost Effective Installation! DO NOT use this system when the soil has iron oxide in it. Call us if you have this kind of soil and water conditions.